and receive the pain which is much too difficult to voice. their dreams, their hope for the future. and returns to you give us courage. May the comfort of your presence bring healing. May the strength of your love restore hope. Amen. A few days ago there was sad news that Ottawa Senator hockey star, Erik Karlsson and his wife Melinda had lost a son. Initially the reports were confusing but we eventually heard that this was a stillbirth, only a month before the due date for their child, whom they named Axel. It struck me that sharing this loss was courageous on their part, in the midst of grief, and I was grateful they did so. This is a private grief which many parents experience. Through my years of ministry I was asked to preside at a number of funerals and memorials for children who died as the result of miscarriage (early in a pregnancy) and stillbirth. As I write I recall the service for twin girls who died close to full term and can see their tiny bodies vividly in my mind. It was as tragic as any other experience of death. Always these were intimate moments, rarely with more than a handful of people present. In earlier years a grieving mother or parents might receive little support from other family members who didn't understand why a ceremonial leave-taking was necessary. Some well-meaning people would offer platitudes which harmed rather than healed. Fortunately that changed over time. While I was not at all prepared for my first request I quickly came to understand that the sense of loss was powerful and what a solemn and sacred loss responsibility this was. For some parents the grief and depression can be lasting, even when other children are born. There is no replacing an anticipated child, any more than we can replace an infant who may die after a full-term birth. 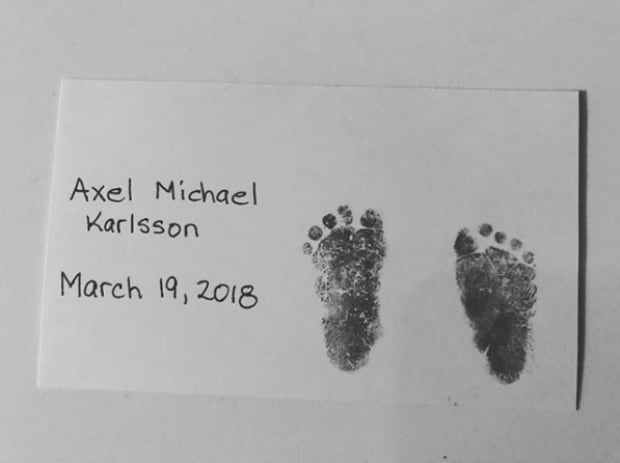 The Karlsson's issued a statement thanking people for support in such a difficult time, along with a photo of Axel's footprints. At this extremely difficult time it's hard to see the light at the end of the tunnel, but we know one day we'll get there. We would like to thank everyone for the love and support we have received and also for respecting our privacy and the process that we need to go through.We feel very lucky to be Axel's parents. Even though he was stillborn, we know we will hold him again one day under different circumstances and the joy he gave us will be with us forever. I hope we can all provide prayerful and practical support for those who go through this unique "valley of the shadow." One of the saddest losses in life has to be the loss of a child...you do not expect to outlive your offspring - losing an infant child cancels future joy and hope and is almost completely unbearable. It is good to have support protocols in place for parents and extended family. Love the prayer at the beginning of your post.